When an American hooks a big halibut he never gives the line a sudden jerk in case the wood splits or the baidarka [kayak] is capsized, so he draws it in and lets it out again until the halibut is exhausted; after this the fish can be killed with a blow on the head from a stick. Halibut was a staple food, eaten fresh, dried, or smoked. The large fish were taken using V-shaped wooden hooks that floated a short distance above the sea floor, held down by a stone sinker. This hook is carved with animal faces which faced downward so that bottom-dwelling halibut could see and be attracted to them. A strong line made of twisted kelp, sinew, or baleen extended up to an inflated animal stomach buoy on the surface. Bobby Stamp: I’ve never seen it, but it’s been explained to me how they made [halibut] hooks. Someone and I were talking about this the other day. Here’s a little tree like this about, let’s say this is the top of the tree. Then you find a limb that is growing like this. Bobby Stamp: Yes, downward and then you’d whittle it down to about this wide. . . . And on the end you’d take duck bone [to make the barb]. . . . Your line is tied onto here. There’s no holes on it, your line is whipped [lashed] onto that. And down here, remember I told you about that rock [sinker] with the slip knot. Laurie Mulcahy: What kind of bait? Bobby Stamp: Oh whatever, blubber, flounder, bullhead, porkchops. Laurie Mulcahy: Porkchops! So you put the bait right on the duckbone? Bobby Stamp: Yes. . . . Well you could see how big a codfish mouth is. He wouldn’t have no problem getting that and neither would a halibut. But where I was at, see, now here’s your line and here’s the beach, and here’s the sea. It’s low tide at this level. . . . You run your line out. Say it’s high tide now. . . . You ran your line out here, and it’s going to be like this. Here’s that rock [sinker], and this [hook] is made out of wood and it’s floating up like this. That’s how it would look like when the tide came in. . . . That would be the position it was in, so you see when a fish came here and he bit on that. Laurie Mulcahy: I’ve seen this portion [barb], but I’ve never seen the duck bone on it. Bobby Stamp: Yes, well they used duck bone or ivory or what in that. We were talking about it the other day, these new hooks they got. Those new halibut hooks, if you watch them, it’s the same principle. And they’re supposed to be good. Laurie Mulcahy: It’s been tried and proven over time that it works. 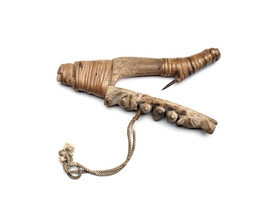 Did this bone or ivory have to be grooved at all to be tied on? Bobby Stamp: No. See, a lot of this was tied with sinew and dried. When it dried up, it got real tight. And after they use it for awhile they take it up and dry it up again. . . . That’s same way with this kelp. That was dried up, and then they’d use it. And then it would get limber, and they would dry it up again. Bobby Stamp: Oh, you’d find them probably this big, . . . five inches. . . . And they got a round . . . notch in it like this. Well, what I was told that, see, they were using kelp [for line to attach a sinker to a hook]. . . . They would set that with a halibut hook on it. See, on that rock, see here’s the end of the line here.
. . . They tied that rock [sinker] with a slip knot on it. That hook is floating from the bottom and that rock is here [below it]. Bobby Stamp: Yes, that’s just to hold it there. And it’s got a slip knot just tied around, so when you put tension, when this is stretched, it comes loose. So if a fish got caught on there, it pulled that loose [from the rock] weight. And it was free to roam around, pull or whatever, and that didn’t get hung up on anything. Then at low tide they go back and get that rock and keep using it over and over again. . . . At high tide, when they caught a fish or halibut, they just pulled it in. I’ve seen halibut pulled in, big halibut.